Professional mountain guides are integral to educating mountain travelers and safely leading adventures into the mountain ranges of the world. 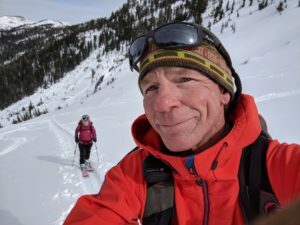 We sat down with veteran ski guide Dave Nettle to ask him a few questions about the value in hiring a professional mountain guide in the context of backcountry skiing. 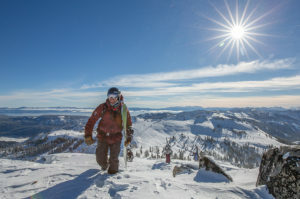 -What are the benefits of hiring a mountain guide for backcountry skiing or riding? When anyone goes into the backcountry the first considerations are usually, “where do I go and where are the best and safest conditions?” A guide dials in these questions with their local knowledge of which areas have the best and least tracked up terrain that day as well as a sense of current weather patterns and direct experience with the snowpack over the course of the entire season. Hiring a guide is a great way to maximize your backcountry experience because they are out there often enough to choose an appropriate tour that will be fun and safe for that day. -When considering the vast choices in hiring a ski guide, what separates a good mountain guide from all the others? The hallmark of a good guide is a well-rounded ski mountaineering background and the ability to pick up on the skill level, desires, and fitness of the folks they are leading. It’s not enough to just be out in front taking people on a standard pre-arranged tour: the real art of guiding is being able to sense the desires and dynamics of a group and being able to subtly adjust the day to provide the most satisfying experience for everyone. For some folks that may be a hard-charging day to a summit while others may be just out to get in some good turns with friends. These “soft skills” combined with wilderness first aid and avalanche safety training make a good baseline. 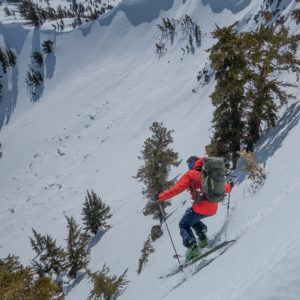 If steeper alpine terrain is on the menu then the guide needs a solid background of alpine climbing to add a layer of safety for all the variables that exist beyond the skiing part of the adventure. -How do you find the right guide? Go online and type in: www.alpenglowexpeditions.com then read up on the variety of programs available or call for help in getting matched up with the best program and a qualified guide. -Should your mountain guide be focused on teaching skills or just finding the goods in the backcountry? Every day in the backcountry is an adventure and an opportunity for everyone to learn and refine the skills that will make their tour safer and more enjoyable. A good guide is always on the lookout for ways to help their folks improve efficiency with their equipment and movement. From suggesting ways to make smooth kick turns and streamlined transitions to managing clothing comfort, even the most experienced person will benefit from a few tips along the way. Even if a guide is taking a very experienced skier out just to “get the goods” there will be some teaching about the terrain and conditions that will be encountered that day and why the specific ski descent strategy is being used. Groups maximizing the day by hiring knowledgable local guides. -Why utilize a guide service like Alpenglow? A ski guide is a professional who has combined many years of personal on-mountain experience with specific safety and technical skills training in order to provide a personalized fun and challenging adventure in a wild environment with the highest level of safety. Hiring a guide through a reputable Guiding company helps support and encourage a high standard of skill and safety in the industry by making guiding a viable way to make a living. -Is it customary to tip your mountain guide? -How does a mountain guide assess field conditions to provide the best experience possible on any given day in the backcountry? Choosing the terrain to ski for the day is only partially influenced by “what the customer wants”. As a guide, it is assumed that one of the main reasons you are being hired is to make a good decision for the day under the present conditions. A morning guide’s meeting with input about weather, avalanche conditions and what has been observed in the field by fellow guides helps form a working plan for the day. Once in the field, there is an additional layer of assessment about how the actual conditions match up with the morning plan, which could lead to a more conservative or possibly a more liberal use of terrain. A confident and assertive guide who is out to provide a fun and safe ski experience for everyone can present great options within the customer’s expectations without being coaxed into going against their morning plan and on the scene judgment.